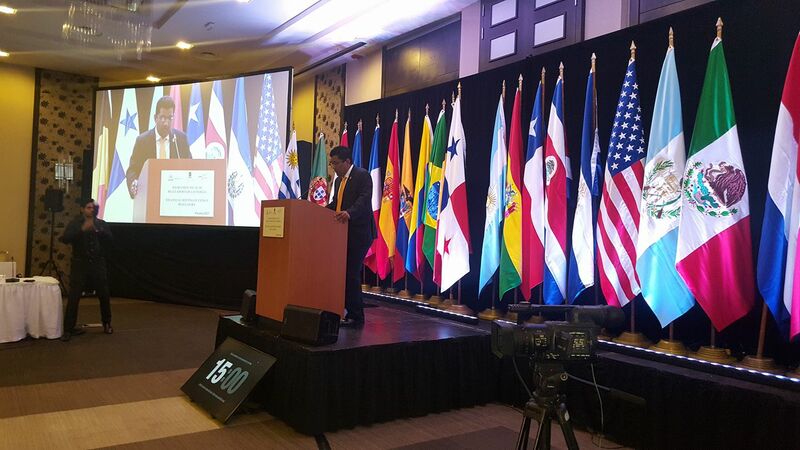 21st Annual Meeting of Ibero-American Energy Regulators Expo Eventos de Panamá, S.A.
Panama received 26 energy regulators from 20 Ibero-American countries for the 21st Annual Meeting of Ibero-American Energy Regulators. This event is promoted by the Ibero-American Association of Energy Regulatory Entities (ARIAE), and it also includes the Central American Electricity Market, the Regional Commission of Electrical Interconnection (CRIE). There were 3 days of knowledge exchange among the attendees. Mr. Emilio Sempris, Minister of Environment of the Republic of Panama, attended the meetings as well as prominent figures in the sector. In addition to acquiring and sharing knowledge on energy regularization, the attendees were also able to experience a wonderful excursion through the Panama Canal in an exclusive boat that traveled through the Pedro Miguel and Miraflores Locks until reaching Gamboa. Also the attendees were able to use the Sombrero Pintao (hat made by Panamanian craftsmen), taste the delicious Panamanian food, among others. Expo Eventos de Panamá is pleased to have provided its professional services to ARIAE and make the event a success from start to finish. With a professional staff, Expo Eventos welcomed the attendees and provided support in each of the areas that the annual meeting of energy regulators required.